Youth interested in qualifying for Wisconsin’s 2020 4-H Shooting Sports National Championships Team will compete in Competitive Shoots across the state in 2019. Scores from these competitive shoots will be used to determine who will represent Wisconsin on the 2020 National Championships Team. A summary of scores required to qualify for national and the location of the various 4-H Shooting Sports events across Wisconsin in 2019 can be found at WI Qualifying Requirements for the 4-H National Championships. Tournament rules and and registration forms for competitive shooting sports events scheduled to date are posted at the Competitive Shoots page. Shoot scores that qualify for national are designated as National Qualifying Event or NQE. Those who meet the national age requirement will automatically have their qualifying scores submitted for consideration on the Wisconsin Team. For example, if you shoot in the required number of statewide events for your discipline(s) in 2019, you will receive notification to complete an application in December 2019 for the 2019 National Championships that will take place June 21-26, 2020 at Grand Island, Nebraska. How to Apply Those who participated in 4-H competitive shoots during 2018 and met the qualification requirements should receive in December a notice to apply. The application is available on the State 4-H Shooting Sports web site. Applicants will submit completed applications via email to the State 4-H Office. Once the application deadline is reached, the top four participants will be set for each discipline team. You will be notified about your team status in February, 2019. Team members are seeded by their scores from the competitive shoots. Teams not having four members will be open for a second round of applications once the first round application date is reached. Second round applications are those applications received after the deadline date for first round applications. These applicants (like first round applicants) are seeded according to their competitive shoot scores. Once the deadline date for second round applications is reached, any remaining team openings are filled on a first come basis by those submitting an application. These applicants must be competitive in their shooting skills to make a team. Once teams are set you will be notified via email regarding how to complete your national registration and pay the national fee. Coaches will be contacting team members to start practice in April and May. 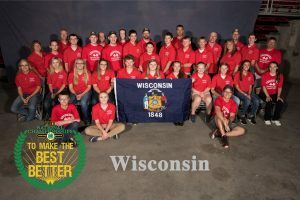 The Wisconsin Chapter of the National Wild Turkey Federation continues to support Wisconsin 4-H Shooting Sports statewide and the National 4-H Championships held annually in Grand Island, Nebraska.